Friday was a blast. 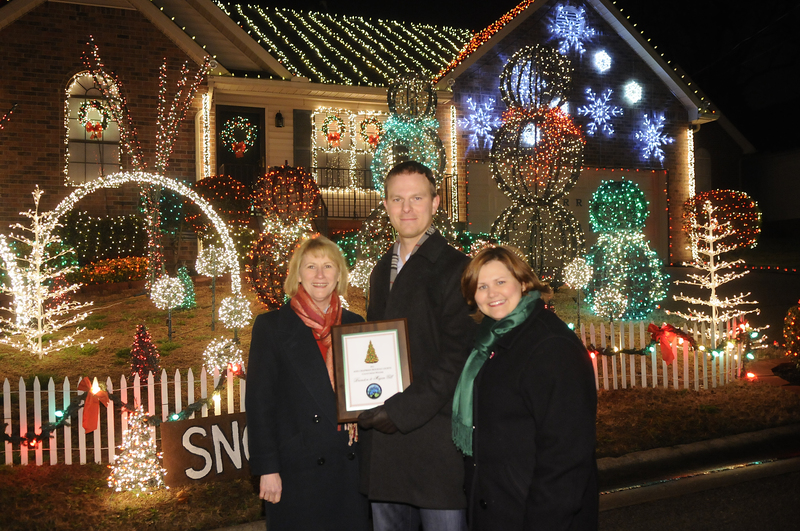 News Channel 5 and Mayor Karl Dean and the Nashville Beautification and Environment Commission came out to award us as the Grand Champions of the 24th Annual Holiday Lights Competition. Check out the pictures of the night! If you want to see all the winners please click here. We probably saw 300 cars on Saturday night alone. It was amazing. It is amazing to be part of such a giving community. The donations for Second Harvest have been such a blessing! We have raised 4,500 meals for Second Harvest and hope to do more. Please come by on Christmas Eve or Christmas Day and bring some canned food! We will be here with Candy Canes for you! Tuesday night we went to the Award Ceremony and it was wonderful meeting the wonderful people who work so hard on their Christmas Lights! We are proud to be a part of such a hardworking and giving group of people with the Christmas Spirit! Wednesday morning we were asked to be on News Channel 5+ Morning Line. We were on the show for the whole hour! It was so fun. The show went through all 5 regional winner videos and had to comment on all of them. They were all so creative and different this year. One thing in common we all have is that we are all crazy hard working Christmas Light People. You can check out the 5 regional winners on Channel 5 here. Our Angry Birds Video on YouTube has been a big hit also! We have received 5,300 views on our video. Please share with your friends and family!